German manufacturer be quiet! 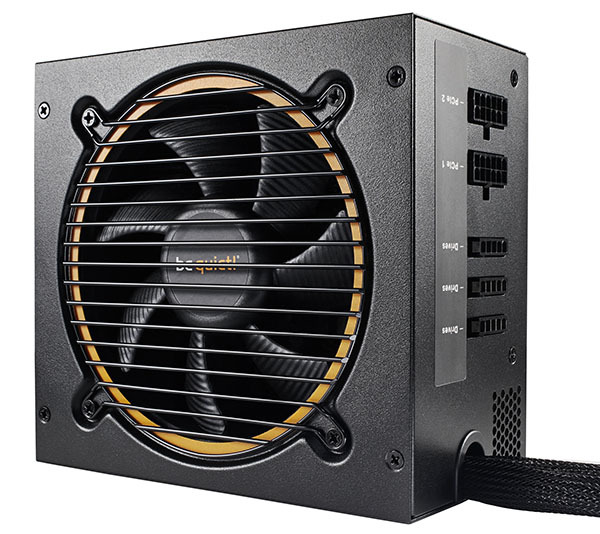 has expanded its PSU line-up to now include seven series. The SFX Power 2 caters for small-form-factor systems while, at the other end of the scale, the 80 PLUS Platinum-rated Dark Power Pro 11 offers excellent performance for enthusiast systems. But what if your budget doesn't go that far and you simply want a quality supply? Well, there are plenty of models to choose from. Updating the platform, be quiet! is today introducing a quartet of Pure Power 9 CM PSUs - 400W, 500W, 600W and 700W - priced from £55 to £90 - and they're all certified with 80 PLUS Silver certification and modular connectivity. Let's take a look at the 600W iteration. This supply takes over from the Pure Power L8 yet has a number of incremental improvements. Chief amongst these is an improvement in the efficiency, from Bronze to Silver, a new fan, and revised cabling to match the all-black aesthetic. The first batch includes semi-modular cabling while the captive cabled variant will arrive a couple of months later. We like the new style, which is more in common with be quiet! supplies in the upper echelons, and the 120mm fan can push a maximum of 52cfm at 1,800rpm. The fan doesn't switch off at low loads, unfortunately, but its 500rpm spin rate is maintained at up to 60 per cent capacity, according to be quiet! 's internal testing. Upgrading efficiency is par for the course amongst generations. Pure Power's Silver certification means it is at least 85 per cent efficient between 20 and 100 per cent loads, based off of a 230V input, and this is one reason why the company claims the fan produces little to no noise. 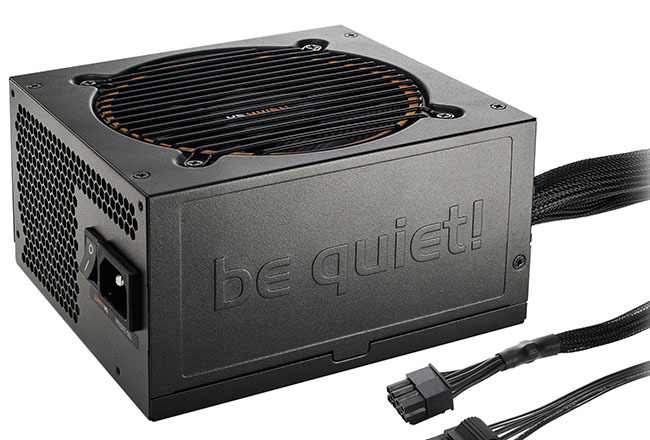 Overall build quality is up to the usual be quiet! standards, so it's free of squeaks and rattles. The captive 12V P8 connector - or 2x P4 - is now 600mm long while the main 24-pin ATX is 550mm - the lengths are better than the previous generation, and whilst not flat, the all-black aesthetic is certainly cleaner. The remaining cables are flat and match the black of the sleeved power set. Two runs of dual 8-pin PCIe, 500mm long, enable multi-GPU support for both Nvidia and AMD graphics. Three extra runs, starting at 500mm, have six SATA, three Molex and a floppy between them. It's handy there's a single cable with a trio of SATA if you choose to go down the modern path with SSDs and mechanical drives alone. 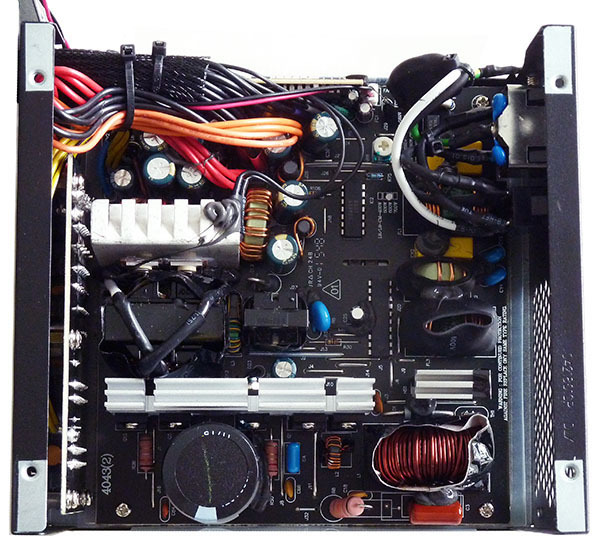 You'll note that the five cables match the ports present on the PSU, meaning you can use all cabling concurrently. be quiet! used to colour code a few of the ports for easy identification, though we feel as if that's not needed here. We're used to seeing single-rail (12V) supplies in the main, but be quiet! continues to use dual rails in this instance. What's more impressive is that 600W is rated at a reasonably toasty 40°C. No surprises on the inside, either. If you look closely, there are a number of improvements over the last-generation Pure Power L8, including solid capacitors on the modular board (left), two temperature sensors for improved fan-speed profiles, and better regulators to inhibit coil whine. be quiet! states the platform benefits from being an active clamp design. 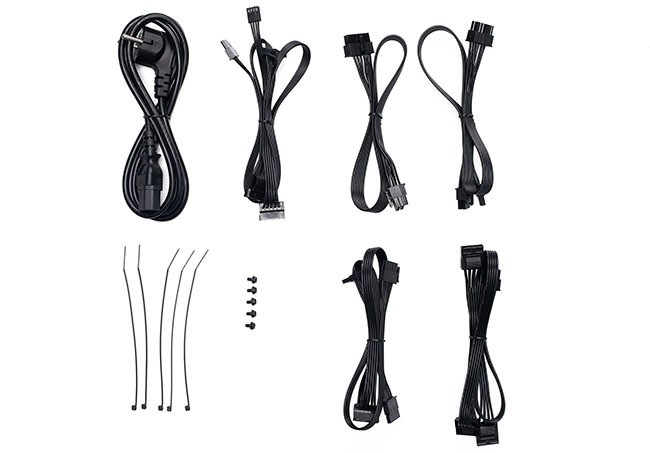 The truth is the company has been using an active clamp for multiple years now, but the actual benefit of the Pure Power 9 is with allying the clamp with a synchronous rectifier, whose job is to replace older diodes with MOSFETs for improving efficiency in the conversion between AC and DC current, particularly so for the smaller lines. Long story short(er), this supply has better efficiency than its direct predecessor. Arriving at the same £75 price point as the outgoing model and backed by a relatively short three-year warranty, let's now examine just how good this supply really is.